Pinto beans and cornbread sounds like an easy enough meal to make in a crockpot. Right? You have to let the beans soak for hours, so why not let them soak in a crockpot on low. Sounds pretty reasonable to me. I like pinto beans (and the price of them) but tend not to think about soaking them ahead of time. I looked on Pinterest to get an idea of cooking pinto beans in the slow cooker, found a recipe that looked fairly easy, and sort of followed it. The recipe said to cook it on high for so long then on low. Well, I’m trying to make most of my 30 Days of Slow Cooker Recipes the cook-on-low-all-day type to make it convenient for those hard-working people who have to work all day long. They can’t rush home in a couple of hours to turn the crockpot knob from high to low. Wash pinto beans in a colander, checking the beans before you add them to the crockpot (so that there are no bean look-a-likes, rocks, bad beans, etc.). Make your favorite rice and serve the beans over rice. I like barbecue baked beans, so I wanted to try the pintos out with barbecue sauce. At the end of the 10 hours, the beans were not as soft as I preferred but had a good flavor. They weren’t hard, but neither were they easy to mash. I tried to mash mine to see if they could be used for refried beans. They needed to cook a little longer for that. At the time, I was visiting my daughter, son-in-law, and granddaughters. The day I cooked the barbecue pinto beans was a very busy day. Therefore, I let the beans cool and put them in the frig. The next day I put them in a pot to a boil then on low for an hour or so, mixed in some brown rice I had cooked, and they tasted great. Personally, I think it’s best to let the beans soak overnight. However, cooking them in the crockpot is doable and very easy. Let me know if you’ve made barbecue pinto beans in a slow cooker and how yours turned out. Got advice on this recipe? I’m open to suggestions on this one. I’ll make this one again, probably with a little more barbecue sauce and a little less water next time. 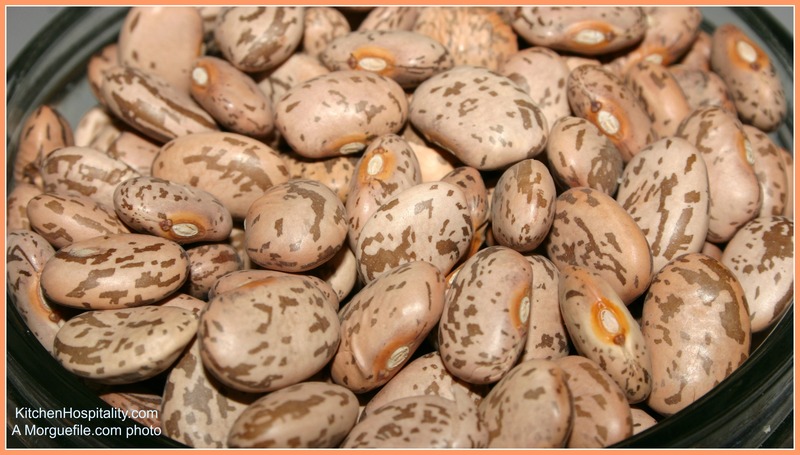 Beans do not get soft when cooked with an acidic ingredient in the crock pot. The tomatoes in the barbecue sauce are probably the reason they stayed hard. I have cooked beans on high all day in my crock pot without soaking and they come out fine. You just have to make sure that there is enough water in them. In the future, I would cook these beans until tender with the garlic and black pepper, then add the barbecue sauce for the last part of cooking time. Something about the heat of the crock pot and acidic ingredients with beans doesn’t work out right. Also, you can quick soak the beans by putting them in a pot with water, bringing the water to a boil, turn off the stove, and let the beans sit for an hour. Drain them and then proceed as usual.